This August, Singapore Lyric Opera (SLO) presents Gala Concert, which will see the debut of two Asian singers who have made it to opera houses in Europe and America. Local conductor, Joshua Kangming Tan returns to lead the Singapore Lyric Opera Orchestra at this concert. Comprising virtuosic pieces, this performance promises to enchant the audience with various celebrated opera excerpts such as Faust’s The Jewel Song, Lehár’s Vilja Lied, Puccini’s La Bohème, Lehár’s The Merry Widow and Giuseppe Verdi’s Rigoletto, to name a few. The two Asian singers who will be making their Singapore debut are British Sri-Lankan soprano Kishani Jayasinghe who is based in United Kingdom, and Filipino-American tenor Arthur Espiritu from the US/Philippines. Kishani, a Young Artist from the Royal Opera House, Covent Garden, who has performed for His Royal Highness, Prince Charles' at his 60th birthday celebrations at Buckingham Palace and Her Majesty, Queen Elizabeth II as a Commonwealth Arts Representative, is excited about singing in Singapore. “I have been fortunate to sing on many International stages around the world, from Europe to America, but I am simply thrilled about being able to sing in Asia, my home region. I am particularly excited about singing in Singapore, and to do so at the magnificent and beautiful Esplanade Concert Hall, is a real treat. 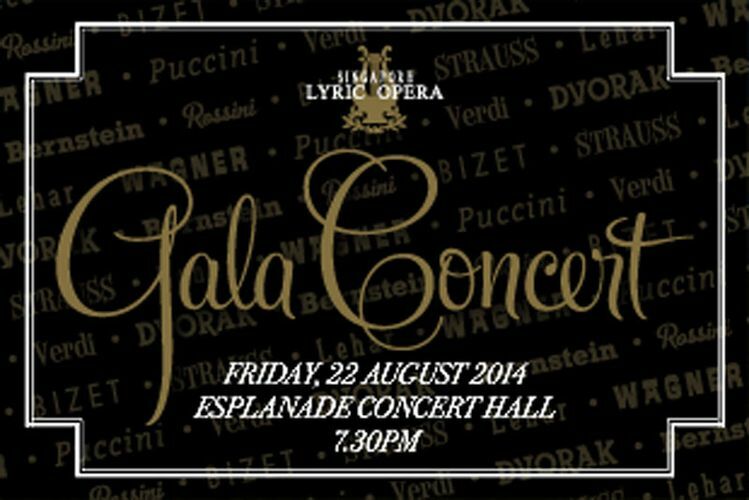 I am looking forward to making my debut in Singapore at the Gala Concert. I am sure it will be a really magical evening,” enthuses Kishani. Also making his Singapore debut is tenor Arthur Espiritu, who has performed in numerous concerts worldwide. Joining both Kishani and Arthur are revered local opera singers, mezzo- soprano Anna Koor, who is widely known for her rich and mellow timbre, and baritone William Lim, a New York ‘Silver Rose’ award recipient.